Toronto, Ontario--(Newsfile Corp. - October 11, 2018) - Pancontinental Resources Corporation (TSXV: PUC) ("Pancon" or the "Company") is pleased to announce its signing of a Memorandum of Understanding (MOU), effective October 1, 2018, with the Flying Post First Nation (FPFN) in northern Ontario. 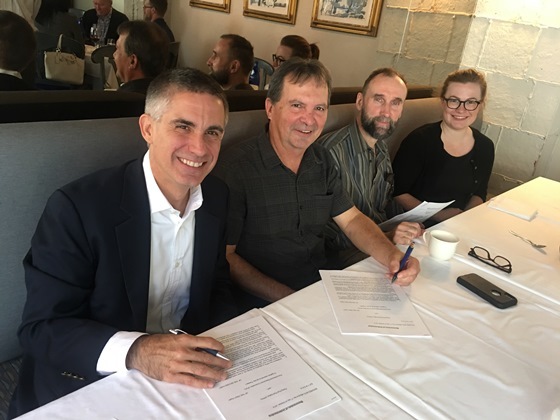 The FPFN-Pancon MOU provides a mutually beneficial framework for cooperation on the Company's three battery metals exploration projects, located 65 kilometres northwest of Timmins: the Montcalm Project, the Gambler Project, and the Nova Project. Murray Ray, Chief of Flying Post First Nation stated: "Flying Post is pleased with the signing of the MOU. The agreement outlines a process for mutual engagement throughout the exploration phase. Flying Post believes that exploration activities should be done in a manner that is respectful of traditional and treaty rights and the environment, and provide employment and business opportunities. The signing of this MOU is a promising first step in establishing a meaningful relationship with Pancon." Layton Croft, Pancon President and CEO, stated: "We look forward to a productive, long-term relationship with the Flying Post First Nation as we advance our Montcalm, Gambler and Nova projects near Timmins. This MOU is a tangible example of Pancon's Community Relations Policy, which affirms our Company's belief that minerals exploration and mining — in addition to creating value for shareholders — can and should be a positive catalyst for environmental stewardship, economic development, and social responsibility. We conduct our business activities in pursuit of these outcomes, and to create shared value with First Nations, host communities and other stakeholder groups." to come to a negotiated settlement of financial compensation for exploration activities. The MOU emphasizes the prioritization of business opportunities, employment and training opportunities for FPFN businesses and individuals. Pancon will provide capacity funding to compensate for impacts caused by on-the-ground exploration activities. Pancon will grant 50,000 option to FPFN at an exercise price of $0.06, subject to approval of the TSX Venture Exchange, with all of the options to vest on the approval of the TSX Venture Exchange. Pancon will also grant 50,000 shares to FPFN, subject to approval of the TSX Venture Exchange. The MOU also describes the process of negotiating and implementing a subsequent Impact Benefits Agreement (IBA), which would take effect once any of the three Projects has completed a Feasibility Study.